Want to know how Christian Edition stacks up against the other "unknown" distros of 2013? Click here to find out! Having been a fan of Ubuntu Christian Edition (Ubuntu CE) for years, starting with Ubuntu CE 5.0 and 6.0, I was somewhat saddened when David Kuntadi, who had been assisting a lot with the project, left the team for other business. After that, and with my own Masters degree work in Religion (finished in May-13), I had to back away from Linux in general and CE in particular. 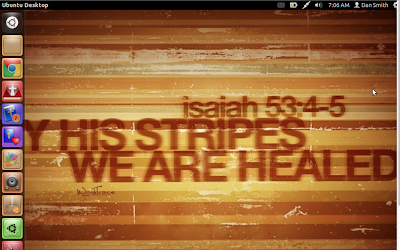 I did help with Ubuntu CE 6.0, providing desktop backgrounds for the project. I didn't even know there was a new project going. I'm so happy to report that Ubuntu Christian Edition is back in the action! 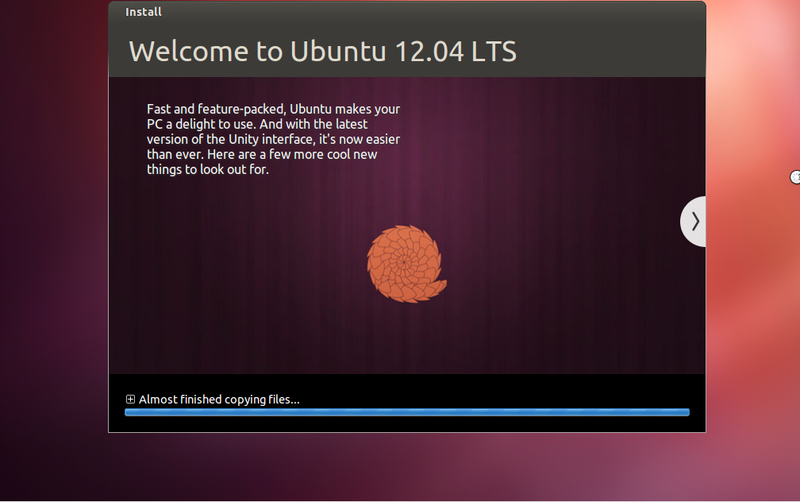 Sadly, they kept the Ubuntu 12.04 Unity desktop. With all that Ubuntu does well, and they do so much, Unity is the worst idea ever. I say that while looking at my Macbook Dock, so take that with a grain of salt. Still, what Apple does extremely well, the developers at Ubuntu have not. Unity is bulky (especially on smaller screens) and while it has some customization, it is so far out from what the traditional Linux desktop looks like (whether you talk about KDE or Gnome) it's almost disgusting. Using something like Mint's Cinnamon desktop, or xfce, or honestly anything that looks more traditional would have been a blessing, but aside from the desktop, it's a good system. Ubuntu Christian Edition has been accused of just slapping some Bible study tools onto a Ubuntu platform and marketing it as a different distro. Go to that review if you're interested in CE and read the exchange between the developer and the reviewer. Very impressive. The review is from a very early version of CE. Hopefully this review helps update the overall process. Installing the OS was easy. 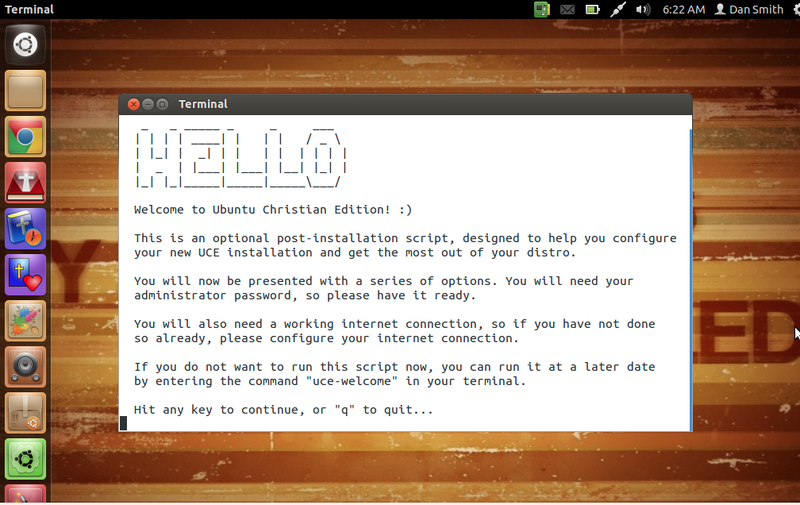 Ubuntu, and therefore Christian Edition, has always been an easy install screen, as pictured above. Things obviously went well as it's basically the Ubuntu 12.04 install process. Nothing is really that different until it's finished with the basic install. Once the OS is installed (I did so on Virtualbox), a wonderful thing happened. 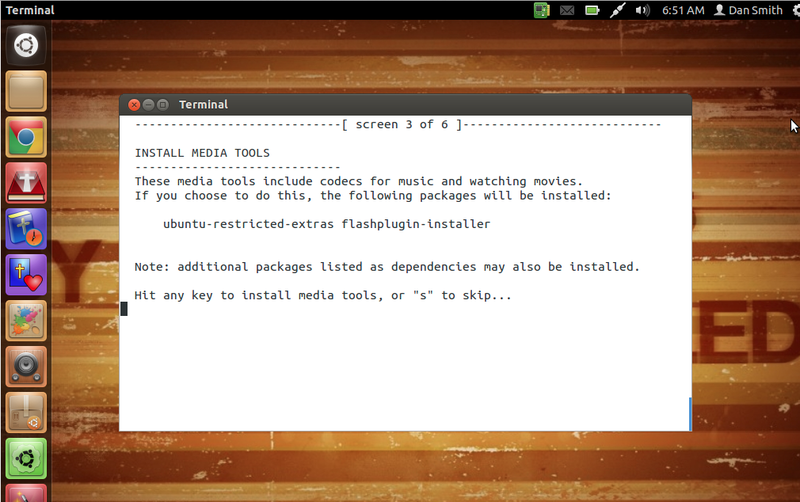 A terminal window (shown below) opened and asked if I wanted to install updates. Hit any key...I dare ya! Just kidding. Please hit any key. It gets you started on the process. 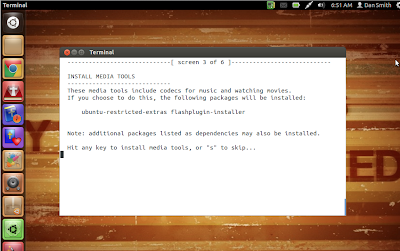 After it spends about 15 minutes retrieving and installing any updates that your computer needs, it will ask you if you want to update the media files, as shown below. As with the above example, all you have to do is hit a key and it will do so. If it took a while to retrieve and install the previous updates, then you might have to input your password. No biggie. Put it in and the installer takes care of the rest. 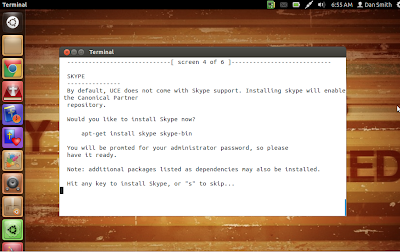 Once the media tools are installed, it will ask you if you want to install Skype. I rarely use the service, though I do have an account, as I have a Macbook and use FaceTime to do most of my video chatting. 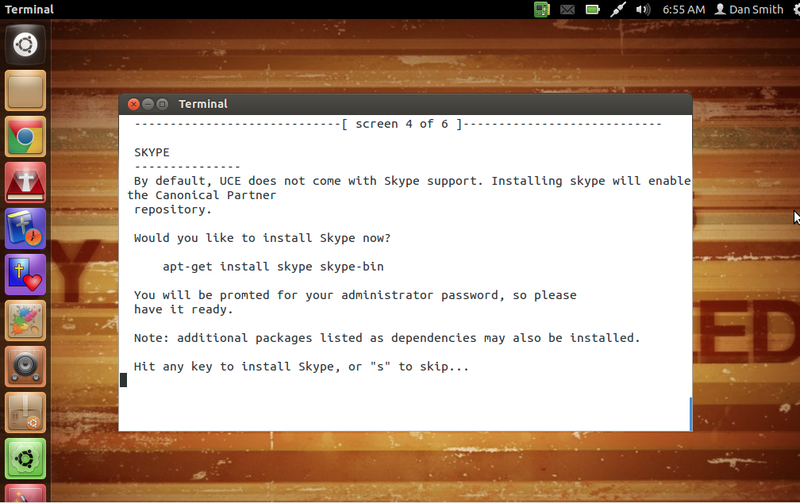 However, as I do have an account, I chose to let Ubuntu 12.04 Christian Edition install Skype for me. Again, if it's taken a little bit of time to install previous updates, it might ask you for your sudo password. As soon as your Skype install is complete, it will ask you if you want to install Dropbox. I'm a huge fan of Dropbox. I use it all of the time. Because of that, it's even more important to me than Skype. Obviously, it was a no-brainer for me. I allowed CE to install Dropbox. 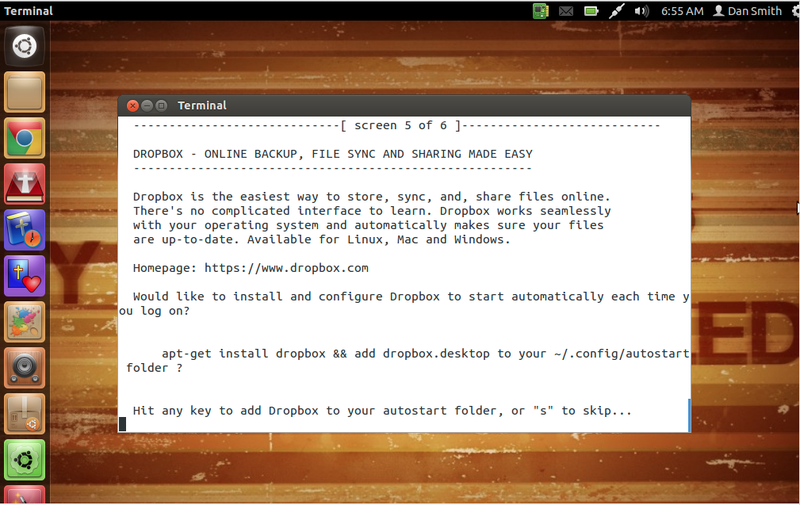 Dropbox is the last thing to install on Ubuntu 12.04 Christian Edition. Once you've finished that, it will ask you to exit the terminal, which will lead you straight to the desktop. 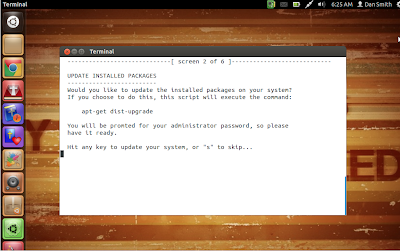 This is the base configuration for Ubuntu CE. As you can see from my screenshots, you have everything on the panel to the left. Included in the base install is Chrome browser, Xiphos, formerly known as GnomeSword, and a small array of other programs. As with it's parent, Ubuntu CE uses LibreOffice for all word processing, spreadsheets, database work, etc. Actually, to be forthcoming, you'll have to go download Base, which is LibreOffice's database program, from the software center. The icon for the software center is the 9th Icon from the top at the left hand side of the desktop pictured above. Here's the skinny on Ubuntu 12.04 Christian Edition: I hate the desktop, but I don't like Unity no matter what else is running it. It's one of those things you either love or you hate. It is what it is. That, however, is the only negative I can see from my tinkering around. 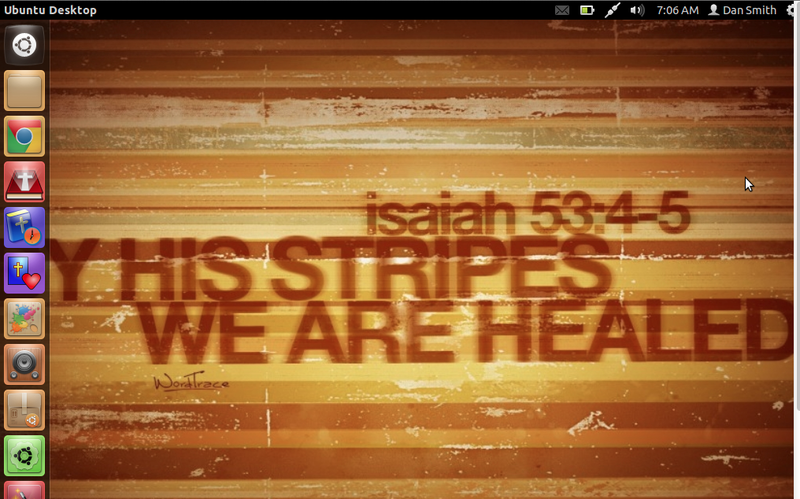 What is absolutely impressive is the ability to fire it up and have a host of programs that aid me as a Christian. It's ready and working out of the box. The distro is perfect for any church that is running older equipment and can't afford to upgrade all the way to Windows 8, which is a pathetic system anyway. You'll have to learn a new Operating System, sure, but you'll have to do that with Windows 7 or Windows 8 (or Mac OSX for that matter), so a pastor or church staffer shouldn't use that as an excuse. The bottom line is that it's ready to go for anyone who needs a complete load-out for Christian-related work as soon as the install is complete. Because I'm so convinced that Ubuntu 12.04 Christian Edition will work for Christians and churches on a budget, I'm willing to help you get set up and running if you get stuck. If I can't answer your questions, I will find someone who can. Despite the obtuseness of Ubuntu's Unity desktop, which is just a preference problem on my part, the OS will help any church save money, which can then be better used to fund ministry and missions. Well done to the Ubuntu CE team. Keep up the good work! Unity takes some getting used to, but as a user who always peeks around the corner to see what's coming, I now find using a OS without Unity slows me down. Hitting the Super key and launching a file or app from there with a couple of keystrokes is far faster than hunting for the document somewhere in a folder. I'm not quite sure what the difference is, as I have had Xiphos and such for years in the regular version of Ubuntu. 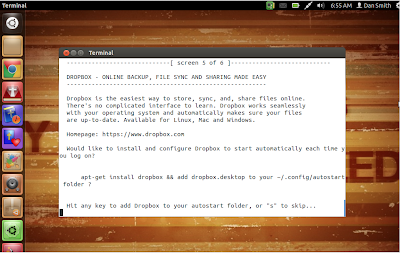 From what I know, it isn't any different at all to have Xiphos in regular Ubuntu or CE. The biggest thing CE brings to the table is that everything is already prepackaged for you. They also developed the GUI for Dansguardian so that Christians wouldn't have to understand how to work the terminal to get it set up. That was a few versions ago, so not as cool now as it used to be. You've mentioned two of my weaknesses. First, that I'm not knowledgable regarding the super key. I need to get there. The other thing is that I dismissed Unity extremely fast. I should go back and look into it a little more. I bet that format will work very well if they get Edge up and running on phones. That would be extremely cool. You hit the nail squarely on the head. If they had used XFCE, LXDE, Mate, or even KDE this would be a no brainer for anyone needing to move from Windows XP to something that will still receive Security Updates and can't afford (or can't run) Windows 7. With the Unity DE it lays a big goose egg. Hopefully the next release will be built on Xubuntu instead. 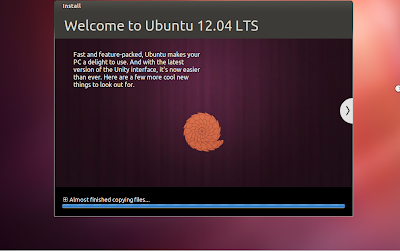 Is there a way to install Ubuntu CE inside of a unit already running Ubuntu 13.10? Similar to installing a diferent desktop edition. In response to your comment above, no, there is not a way. UCE is not a meta package. UCE is an entire distro. As lead developer I can tell you that there are currently repositories being built to allow installation of uce packages but majority of them are already in the Ubuntu main repos. Artwork and Dansguardian setup is what is custom. GNOME Fallback mode comes with Ubuntu CE, for those who prefer to use it. 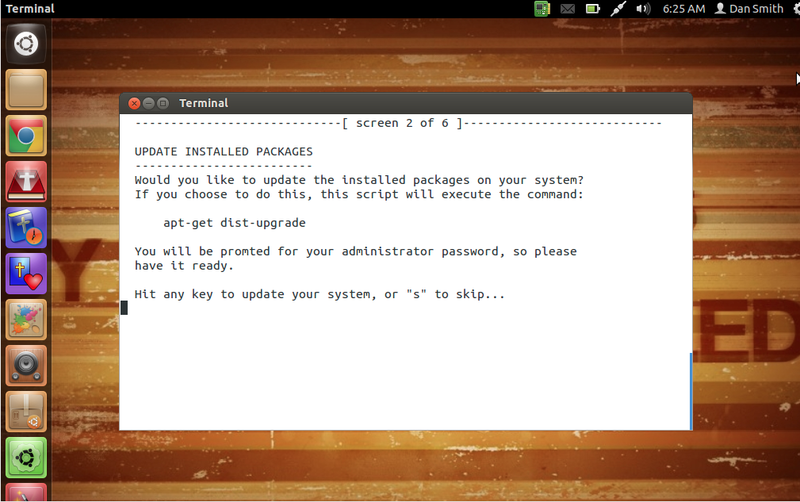 GNOME Fallback is like the GNOME 2 menus, except the System menu is part of the Applications menu. My main issues with Unity are that there are no binaries available for free OS distributions that are not Ubuntu or based on it, and the Super key cannot be used for keyboard shortcuts to open applications. Has anyone tried using this with MATE or Cinnamon DE's? If so, did it work well, or need a theme change to look similar?